For flow visualization, the surface pressure coefficient is plotted for potential flow over a selected airfoil in a data file. The airfoils in this collection represent a small sample of the over 1500 airfoil data files posted on the UIUC (University of Illinois at Urbana–Champaign) Airfoil Data Site. 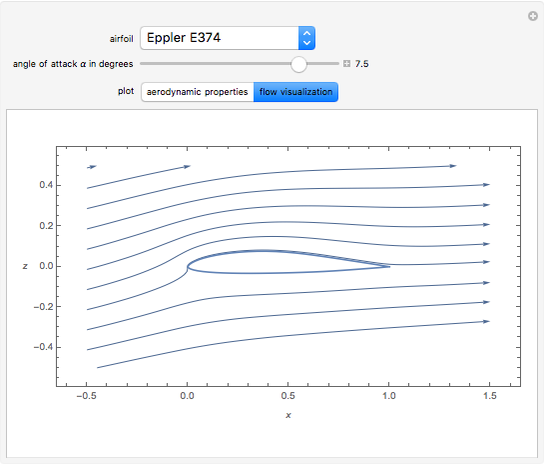 You can vary the angle of attack ( ) of the uniform onset flow with the airfoil. A panel method using straightline vortex panels of linearly varying strength and external Neumann boundary conditions provide the potential-flow solution. The default graphic is a plot of the surface pressure coefficient. 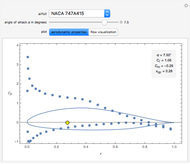 The plot includes values for the lift coefficient ( ), pitching moment coefficient about the leading edge ( ), and location of the center of pressure ( ). 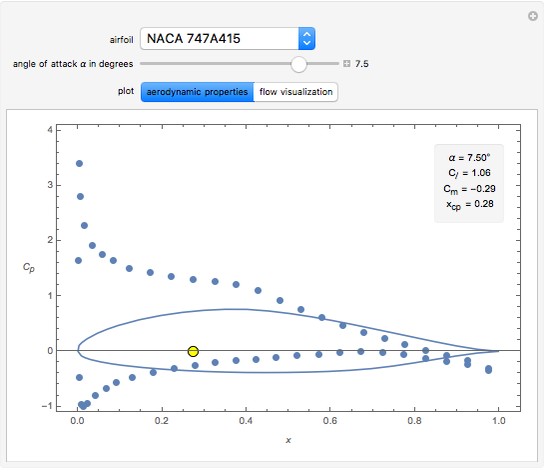 The yellow dot on the graph shows the location of the center of pressure. Alternatively, you can chose to display a flow visualization graphic showing a stream plot of the velocity field. This is an important check on the plausibility of the potential-flow solution. This Demonstration is a companion to the Demonstration "Potential Flow over a NACA Four Digit Airfoil", where the airfoil geometry is specified by algebraic equations. Panel methods are numerical models for solving potential flow over an object, usually of relatively complex geometry. These methods are based on a boundary-integral solution to Laplace's equation. Source, vortex, or doublet singularities are placed on the boundary of the object and suitable boundary conditions are applied. Refer to  for details. The panel method implemented in this Demonstration uses vortex panels and external Neumann boundary conditions. The discretized airfoil is specified by straightline panels, where the circulation density for each panel varies linearly with distance from the beginning of the panel. There are unknown strength parameters in the formulation of this model. Tangent-flow boundary conditions at collocation points provide equations. Collocation points are placed at mid-panel, just outside the airfoil. Continuity of circulation density between panels (except at trailing edge) provides equations, and a Kutta condition (zero circulation density at trailing edge) provides the final equation for a system of linear algebraic equations involving the unknown strength parameters. The system of equations is solved using the Mathematica function LinearSolve. 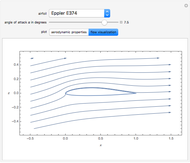 This Demonstration uses dimensionless parameters, with the characteristic length of the problem being the chord of the airfoil and the characteristic speed being that of the uniform onset flow. I. H. Abbott and A. E. von Doenhoff, Theory of Wing Sections, New York: Dover Publications, 1949. J. Katz and A. Plotkin, Low-Speed Aerodynamics, 2nd ed., Cambridge: Cambridge University Press, 2001. UIUC Applied Aerodynamics Group, UIUC Airfoil Data Site. http://www.ae.illinois.edu/m-selig/ads.html. Richard L. Fearn "Potential Flow over an Airfoil Specified by Numerical Data File"